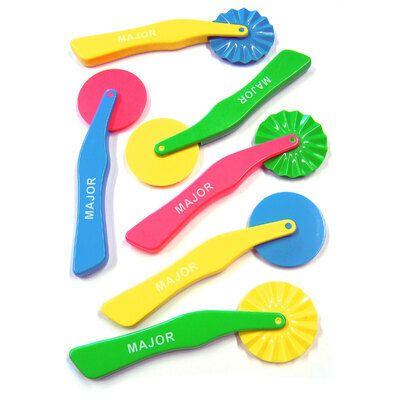 Our Plastic Clay Cutter Roller Pack adds something unique to your existing play resources. Each one has been manufactured from a durable plastic suited to repeated use by smaller children. Bright colours attract attention and appeal to all ages with ergonomic handles ensuring a tight grip during use. Use alongside playdough and other clays to created patterned lines and cuts - each clay cutter will help to develop their skills such as dexterity and hand-eye coordination. This set of 6 rollers features an assortment of straight and zig-zag edges to suit a wide manner of projects. Here at Gompels, we strive to support the creativity of our youngest customers. Our Arts & Crafts category has everything from Air Hardening Clay through to Soft Dough and MDF Modelling Boards, ensuring you have everything you need to host engaging sessions with your pupils.